Housework is here to stay – cold fact. There’s no amount of knuckle-bearing scrubbing or hawk-eyed meticulous wiping that will make the housework go away. You may as well shift the battle to another level. A level where you can bring the housework under your control. A realistic cleaning routine is something that can take the stress out of your household management. How do you feel about a regular day in which you know what cleaning is to be done and you know it’s feasible and won’t leave you drained? And which will give you a home that will be clean enough for you and your family to function smoothly? This can come across as redundant, but you can’t make a realistic schedule without knowing to a t what all those tasks are. We tend to be reactive when it comes to housework – we do things when they need doing, which effectively exhausts us. It also leaves a lot of room for things to get missed and the work may seem forever unfinished. What to do: Make a list of all the things that need to be done by rooms. The operative word here is all. Take an ideal world in which you have the time to clean your home to your highest standards and write each and every task you’d complete by rooms. Don’t get swept off your feet by the magnitude of the list – this is just taking stock of the situation. When you have the list, go through it again and write next to each task how often it should be done, again ideally. For example, daily, weekly, bi-weekly, monthly, annually. You want to have an idea of what cleaning you can tackle in one day. So the next step is to group the tasks according to the frequency you allocated to them. What to do: What are the tasks you should complete in one regular day across the rooms? Try and make a preliminary draft of what 4 weeks would look like. The reason why 4 weeks make a good overview is because you have daily, weekly, bi-weekly and monthly tasks. You could also throw in an annual task. This is the trickiest part. The biggest pitfall is overestimating yourself. Tasks themselves tend to take more time in reality than in our heads and there are many activities that we have to do every day that take time and energy. Bearing in mind these two points will help you avoid overscheduling. What to do: Take into account travel time, meals, shopping and any other regular activities. Calculate the amount of time you can set aside every day for cleaning. 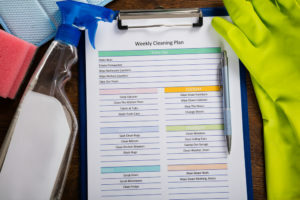 Go back to your monthly cleaning schedule draft and see if the amount of housework per day can fit in your time slots. Make any necessary tweaks. This is all theory, right? It may seem pretty on a piece of paper. But, you have to see how it goes in practice. It’s best you test your schedule for 4 weeks. Don’t get upset if things don’t seem to function. This is a time of gathering feedback from reality. The test period will show you things that work and things that don’t. It will also show you whether you underestimate or overestimate your time resources. This valuable experiment will enable you to make your schedule even more realistic and feasible – so both your home and you look and feel AMAZING. Life is not like “one thing at a time”. You will find that life often gets in the way of your cleaning plans and that’s fine. Cleaning will still be easier with a plan, though, because you will know which tasks will be pushed back and to what time. So, don’t give up. While we’re on the same note of life’s unpredictability, besides rescheduling tasks, you will also realize that you need to prioritize and delegate. Ah, those two pillars of every organization! Make sure you rely on these two to make your schedule work. Finally, make sure you rest. If you have 4-week plans, that means you’ll have a couple of free days every month. Always use them, you need to recharge. Get trusted cleaning service Huntington Beach for help! When you need to delegate some of the cleaning away, why don’t you book some professional cleaning? Cleaners are not only professionals at what they do, but they also love their job (at least the cleaners we work with). Maid This! loves Huntington Beach, but we also serve other communities in Orange County and LA. Take back your time and control of your home – with some professional magic! Book any time in less than 60 seconds and enjoy yourself and the results.